IT Service Management and the ITIL framework of processes is well established in IT operations. Every workflow execution results in a ServiceNow Change Request being opened and, later, closed with an indication of the overall workflow success or failure. This provides a clear, ITIL compliant, audit trail for support and IT and the requests can be fully customized to your needs. Incidents happen. 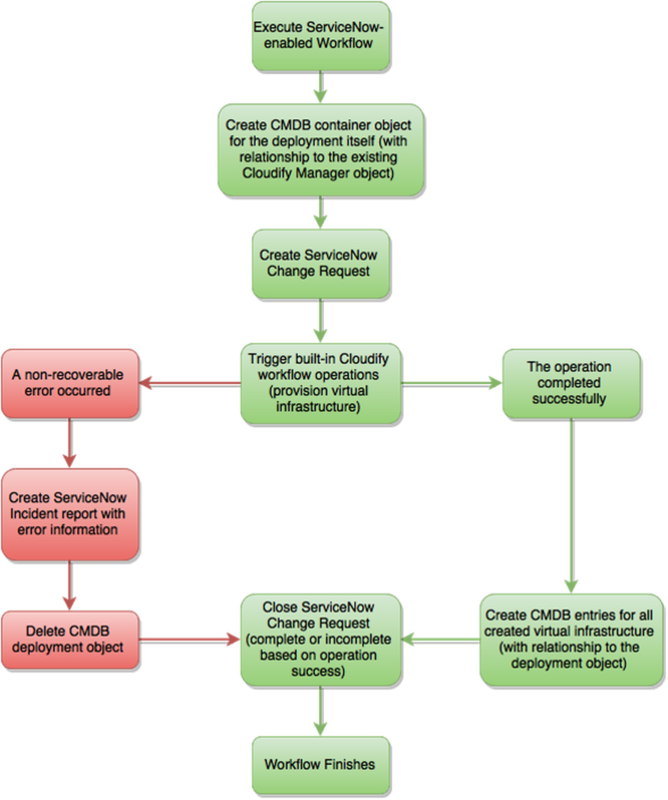 The Cloudify plugin for ServiceNow automatically detects run-time incidents and submits Cloudify error messages directly to ServiceNow so that support or IT is notified in real-time and can investigate further. If you deploy a complex application and nobody (technical) is around to see it, did it really happen? So, you’ve invested time (and money) into modernizing your cloud infrastructure(s), adopted the latest Agile-Lean-XP-Kanban methodologies, shifted application development from traditional workloads to a cloudy model, and automated the result using slick Cloudify application blueprints. Now, the CEO has asked to see what you and your team have done to warrant all of the time, effort, and money. You could describe the efficiency of the new daily stand-ups or how the company clouds are now synergizing harder than ever with the fresh application orchestration engine in place. My eyes started glazing over just reading that psuedo-technical joke. What you should be doing is showing the top dog a graphical, high-level view of all of your cloud applications and resources in real-time. That would show him or her just how real the results are, wouldn’t it? You’re already automating your application deployments; why aren’t you automating your ITSM? 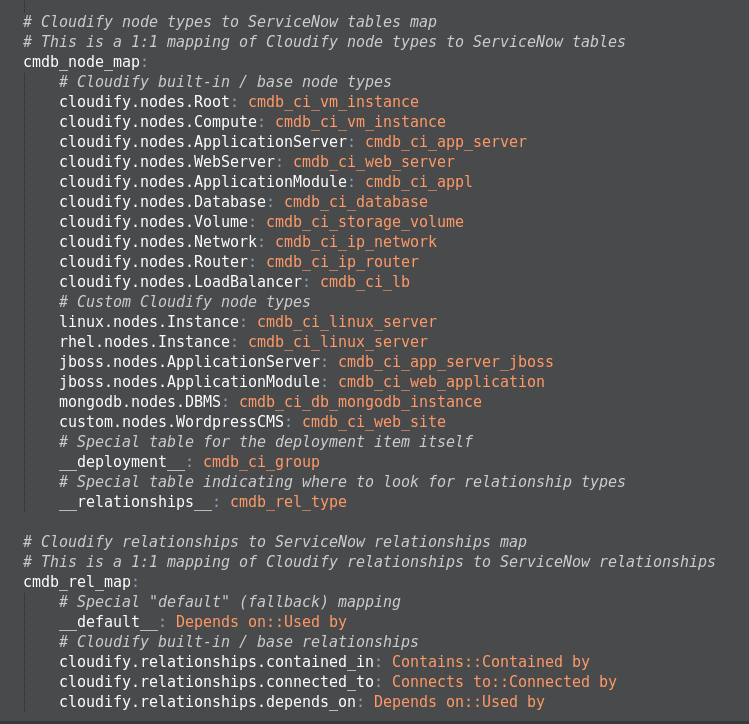 The Cloudify plugin for ServiceNow is a seamless integration providing on-the-fly CMDB updates, automated change requests, and incident reporting. There’s a lot of pieces that are involved in connecting a cloud application orchestration engine to an enterprise ITSM service. To complicate matters further, the majority of Cloudify blueprints and ServiceNow configurations are highly customized to the business(es) using them. So, instead of trying to be all things to all people, the Cloudify plugin for ServiceNow enables users to provide custom configuration data, per-workflow, to ensure that the plugin is mapping data to your exact specification. Configuration data is provided as a standard YAML or JSON file, the same markup you’re already using for Cloudify blueprints.